Some days, I’m pretty sure this site is turning into something of a Dorie Greenspan Fan Club. Let us review, shall we? Dorie brought one of my favorite surprise Paris treats into my very own kitchen, directed us to the most amazing chocolate cookie, ever, her deep, dark ganache tart was the kind of easy dinner party dessert that nobody complains about and just last week, her lemon sables were the ideal palette upon which I could paint my margarita cookie aspirations. Everything you might think you like about my baking, you really like about hers. Today, her latest book ushers in another recipe that I am certain will be a repeat hit (once, of course, I get over my addiction to the shiny and the new). I have to admit, no matter what you call this stuff — corn muffins, cornbread, pone, Johnnycakes — how you cook it — skillet fried, deep fried, on a griddle or in tiny muffin liners — or what a cinch they are to make — think “Jiffy” — the stuff kind of stresses me out, and it’s because there are a thousand different ways to make it and all of them are the “right” or “only” way to someone. When people tell you they like cornbread, they have something very specific in mind and it’s up to you to figure out what it is. I’m no different. Alongside barbeque or crumbled over my chili, anything less that that which is made in a bacon-greased cast iron pan with or without the jalapenos and cheddar just doesn’t seem authentic. But when it comes to breakfast muffins, I want the cakier, sweeter, oh I’ll say it, Northern version, but with just enough grit in them that I don’t feel like I’m eating dessert for my first meal of the day. Dorie gets this. Truth be told, I’d probably two-thirds the sugar next time, but in every other way, this recipe is a keeper. Not too dessert-like, just the right crumb and a super-cinch to make, this is the most glowing success I’ve had getting corn muffins to meet my corn muffin expectations in a while. The fresh corn is an extra reminder that this is breakfast, not dessert. Toasted with a pat of salted butter even two days later, I find it impossible not to like. In a large bowl, whisk together the flour, cornmeal, sugar, baking powder, baking soda, salt and nutmeg, if you’re using it. In a large glass measuring cup or another bowl, whisk the buttermilk, melted butter, oil, egg and yolk together until well blended. Pour the liquid ingredients over the dry ingredients and, with the whisk or a rubber spatula, gently but quickly stir to blend. Don’t worry about being thorough – the batter will be lumpy, and that’s just the way it should be. Stir in the corn kernels. Divide the batter evenly among the muffin cups. Bake for 15 to 18 minutes (12 minutes for minis), or until the tops are golden and a thin knife inserted into the center of the muffins comes out clean. Transfer the pan to a rack and cool for 5 minutes before carefully removing each muffin from its mold. Yay! I’m the first comment and this looks so yummy. I am SO making this for a Cinco de Mayo party on Saturday! I love Dorie too. I think I may be trying another of her recipes this weekend. My coworkers are stoked. This is the second cornbread post I’ve seen today!! It must mean I HAVE to make cornbread this weekend! I think this recipe hits my ideal of cornbread on the dot – sweet, with the whole corn kernels. Yumm! Dorie is the best, but I agree, just little sweetness for the cornbread is enough. Thanks for the Cinco de Mayo ideas. Mmm these look good. I’ve been using Mark Bittman’s cornbread recipe in How To Cook Everything. It’s okay, but is lacking in several regards. I’ve just been too lazy to find a new one. I’ll give this one a go next time I’m going to make cornbread with that fantastic chili of yours I love so much. I’ve liked everything I’ve made from Dorie, so I’m sure this one won’t fail to impress. Especially if it’s approved by The Kitchen! You are on a roll! Though I would never, ever, ever admit it to my southern family, I have a weakness for northern-style corn muffins. What can I say, I like, a little sweetness, a little cake-iness in my day. I like that there’s not too much butter either, that cookbook’s a winner. Those muffins would be perfect, dropped right into a bowl of my tortilla soup! Yum. i can’t wait until Saturday! And I can’t wait to try your empanada’s! and dude, don’t forget! Not only is Saturday Cinco de Mayo, but it’s MY favorite excuse to drink bourbon in the afternoon ever, The Kentucky Derby! This was the very first recipe I made from her new cookbook. It was so appealing, and I wasn’t disappointed. I wolfed down as many as possible with butter while they were still warm. Like little bites of corn heaven! Ohhh Jiffy mix! Those were the best muffins to make when I didn’t know that there were actual recipes in books. The apple cinnamon muffins were the best of the lot. Couple them with a can of coke (hey, when you’re 14, everything goes great with coke) and they’re the bees knees. Just found your site and I think I am in LOVE… thanks for sharing such great recipies!!!! :) I love food. haha love the backward photo shoot ! I am a total corn muffin addict! These are perfect with spicy chili, or for breakfast with some sweet butter. I love corn muffins, bread or anything of the sort. I have found that by adding a small can of creamed corn to the mix, the moistness factor is amped up considerably, not to mention the overall corn-y ness of it. I could eat every crumb of those golden beauties! I’ll never try corn muffin! Do you wanna partecipate at the new round Up MM03??? I’ve had this recipe bookmarked for some time now and really need to make it! Everyone loves Dorie. Thanks for the Cinco De Mayo inspiration! wow..those really make me crave cornbread.. !!! wow those look so good… i’m a long-time reader, just noticed you mentioned in Fitness magazine. I’m a corn muffin/johnny cake/griddle cake/corn bread ‘ho. I’ve been making them from the time I was 8. It’s probably one of the first things my mom taught me to make besides grits. Yeah, I said it, grits! I’m glad that you’ve found one you like and posted about. Your pics are gorgeous and the muffins turned out the perfect yellow color. You should try them drizzled with honey, mmmmmmmm corn muffins with honey. Oh, I love when they have real corn in them! I’m so trying these right away. Pretty much all of my baking is really Dorie’s baking, she seems to affect everything I make, in the best possible way. Can I bake this in a pan? and if I can, what size pan? I really don’t care much for muffins…….. I love this muffin, i might marry it!!!! i say that whenever things that i really luv r like soooooooo goooodd.!!!!!!!!!!! Hey i wrote again, i ate one of these at skool. and that was so the moment i fell in love with it!!! it tastes so good. after i save it , it tastes so much better, u know after a while. I hate to sound like a doofus, but if you use fresh corn off the cob, do you cook it first? I’d loooove to make these today! Live in South Florida and got a few yummy ears of corn from the CSA this week. I made these last night for our chili and cornbread dinner to eat while watching the Superbowl. They are light and corny!! Will definitely make again and again. End result? Mine were really large with sunken middles, stuck to the paper, and were too light to stick together internally. Also could use a little more sugar. :( What do you think was the straw that broke the camel’s back? the Jiffy? the skim milk? sigh. Jiffy mix is not the same thing as cornmeal. It has leaveners and other ingredients in it. Too much leavening will cause sunken middles, odd textures. I made these to accompany a wonderful gumbo recipe that my good friend’s mother gave me years ago. The gumbo is always a rave, but I think this is the first time I got more comments on the cornbread to go with it! Thanks so much…this is perfectly delicious yumminess! I made these corn muffins last weekend and I want to thank you SO much for posting this recipe!!! With your corn muffins I had for breakfast on Sunday, I went on a time travel to the year 1996. My first and (sadly) last journey to New York City — 7:00 a.m. — breakfast at the small cafe that belongs to our hotel — eggs and bacon? no..I have a sweet tooth…give me something sweet! — and there it was…a bright, yellow, warm, soft and tender corn muffin accompanied by unsalted butter and raspberry jam — amazing…! I loved it and I never forgot this taste, never! Here in Germany you won´t get anything comparable. That´s why I startet collecting recipes from every american cookbook or website I could find. I also try to travel to Manhattan again but until today I couldn´t manage… None of the results satisfied my sweet memories. Until I found the Smitten Kitchen. Om nom nom nom … these corny little gems were a hit. I used 2/3 the sugar and they where perfect! heya deb, hope you won’t mind answering this question, but how would you prepare fresh corn kernels? would you just strip em straight off the cob? and would you use sweet corn? You can just strip it and put it in the batter. I prefer it that way, too. I made these last night and they were the best I have ever had! It is sweet corn season here in Iowa so they were amazing with fresh corn kernels. I made them into 6 jumbo muffins and ate the second half with a drizzle of honey for dessert! I made the muffins twice: first time as written, second time without kernels (as per my husband’s request). WOW, we loved them. I am now asked to make them every other Sunday. Your baking recipes are are always so reliable. I also made your peanut butter cookies, brought them to work and they were gone by the end of the day. Thanks Deb! I found this recipe doing a google image search. I made these today without the nutmeg and they are wonderful. Not too sweet and not to bitter. Wonderful texture. This is going in my recipe bin. I found this recipe doing a google image search. I made these today without the nutmeg and they are wonderful. Not too sweet and not to bitter. Wonderful texture. This is going in my recipe bin. And they taste yummy to my tummy! Even my beautiful wife love them!! Mmm. I made these last night, but I made them in a big pan instead of individual muffins. They turned out great and to rave reviews. The nutmeg is a fantastic addition! Delicious! I made these last week to go with a huge pot of soup we were cooking. The soup was yummy but fairly plain, lots of beans and vegetables but not much in the way of spice or kick. So, to make the meal a little more interesting I baked the corniest corn muffins. I followed your advice, Deb, and only used 2/3 the sugar it calls for but I also added 2 T of finely diced jalapenos. My mini muffins turned out splendidly! I love cornbread that is slightly sweet and slightly spicy and these fit the bill perfectly. Thanks for yet another great recipe. made these tonight along with black bean soup. great winter comfort food. Next time I will go heavier on the sugar- I’m guilty of loving the super sweet cornbread. These are sooo yummy, I’ve finally found a cornbread recipe worth sticking with! Thanks!!! im glad i have finally been able to reconcile the fact that even though i am from the south i dont like southern cornbread. i have been making this for a bit now (minus the corn, nutmeg, and half the suger and in a hot buttered skillet) and think i have found cornbread perfection. (for me anyway, please dont tell my mother i have ruined her perfect cornbread recipe:) thank you deb! but i just keep wondering…why the extra yolk? i have a tendency to put in either just one or two whole ones cause i hate to throw away half a perfectly good egg and no one here eats just egg whites. but im sure there must be some culinary reason for an extra yolk right? i dont see that much difference when i do it differently, but my curiosity has finally gotten the best of me. Thanks again for all the wonderful recipes! Hi Heather — Glad you’re enjoying the recipe. Extra yolks are generally for richness. However, if you think you won’t miss it, skip it. I made these tonight with your red bean chili. Exceedingly nom-nom-nom. Thanks!! These were a perfect accompaniment to a bowl of chili on a snowy day. I skipped the extra yolk and halved the sugar – and found the results to be delicious! This has gone to the top of my cornbread list. Just made these this morning before work with my 2-yr-old. Easy peasy! In the oven in 25 min (and that’s with the extra time for toddler helper). They were delicate (I didn’t use stone-ground cornmeal – just the regular stuff) and really really tasty. 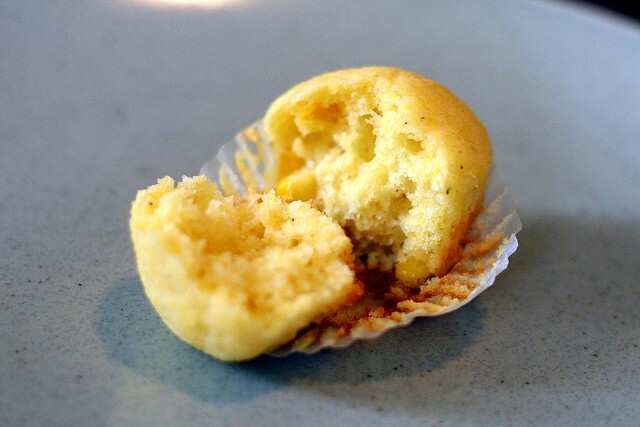 Will make again – although Ina’s corn muffins are another fabulous go-to. Excellent recipe, came out very well and thanks for sharing. Wonderful! 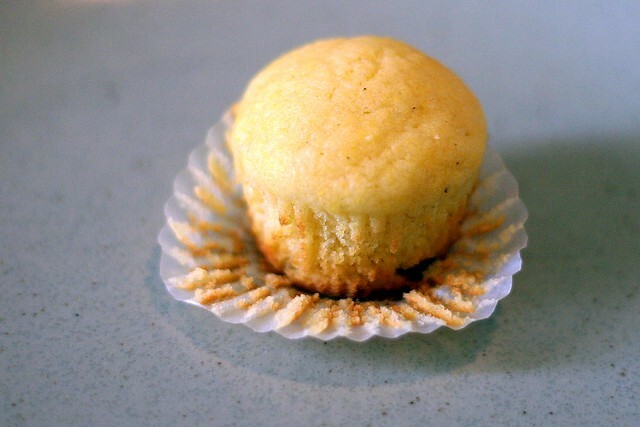 I’d been looking for a corn muffin that was more like the ones served in Seattle cafes; cakey, sweet, not gritty. I myself prefer southern cornbread, but my 6-year-old doesn’t. This is the 4th type of corn muffins I’ve made him and the 1st one that was a success! He doesn’t like the texture of corn skins, so instead of omitting the corn I pulsed frozen kernels in the blender until they were frosty crumbles. He never even noticed, but they do make the muffins nice and moist. I just made these, and I added fresh blueberries — they are scrumptious. Made these last night and they were awesome! Nice and crunchy crust on the muffins since they were baked at high heat and I made sure to put enough canola spray in the bottom of the tins. However, I left out the egg yolk (I never end up using the stray eggwhite and I don’t like to waste), and I left out all but 1 tsp. of the sugar. Didn’t miss either and the texture was perfect! All you Southerners out there that don’t like sweet cornbread (what is that stuff? It’s like cake…), just leave out the sugar and this is awesome. Delicious! I didn’t have any buttermilk (and I didn’t even have any white vinegar to add to milk to make a buttermilk substitute) so I just used a cup of skim milk and it was STILL delicious. A perfect corn muffin! Thank you! Okay, I made what I thought was my “go to-can’t miss” cornbread recipe to take to a Harvest Party and it came out of the oven half cake/half pudding. I only had 1 1/2 hours until we had to leave so I checked your website for a cornbread recipe since I have never made anything of yours that did not turn our delicious. As usual, I was not disappointed! This was perfect! Thanks for saving the day! Hi. When you say you would 2/3s the sugar does that mean you wish you added 2/3 cups of sugar? No, I mean I wish I’d added 4 tablespoons (1/4 cup) sugar instead of the 6 tablespoons that were called for. I prefer a just slightly sweet corn muffin. And so EASY! I had all the ingredients lying around, so it was a perfect spur-of-the-moment way to use the rest of my buttermilk. That dry and gritty Jiffy mix will never be seen in my house ever again. PS I could look at all your pretty pictures forever. I’ve made these so many times for my family. They’re perfect. You might have bought a more coarse grind, like one for polenta. A finer grind should be only slightly noticeable in the end — a vague crunch, nothing that would have you worried about your dental work. I don’t like pieces of corn in my cornbread. Do you think that pureeing the corn would have a negative effect on the texture? Also, what consistency should the batter be before baking in case I need to adjust it? Do you know the muffin man? :) Just made the corn and the blueberry muffins and folks will be happy at work (for a while). Thanks for the beautiful pictures and the photos – LOVE the photos – food photos – yum. Hi Deb, these were awesome. They were the first thing I baked post NY heatwave! Looks Yummy! Glad you included the pix. I love cornmeal muffins but often avoided the ones with corn kernels, however the picture looks like they blend right in, which is great. I made these tonight to go with a big pot of chili. A delicious way to welcome fall! The muffins are moist & flavorful – the perfect accompaniment to any meal but also a great snack on their own. This recipe definitely goes into the keeper file. Thank you. Made these last night to accompany Alton Brown’s gumbo. DELICIOUS!! Soooo, hit the spot. I was out of corn, so omitted it, but these still turned out divine. This is the one for me. The sweetness offset the spicy gumbo perfectly. Only wish I would’ve doubled the recipe!! Thanks so much! Is there any way to make these pareve/vegan or should I just wait for a day where I’m not making meat too? They look so good! I was thinking just soy milk and margarine? Deb, I’d really appreciate the guidance! I made these today, with whole wheat flour and almond milk (and about half the recommended sugar to make up for my sweeter-than-average non-dairy milk). Verdict? Delicious! Perfectly sweet and crunchy (stone-ground cornmeal definitely makes for a noticeable final texture). I will add a little more moisture next time just to help the muffins hold together better once they’re fully baked… seems to be a nuanced challenge when I substitute whole wheat flour for all-purpose white. Their slightly sweet flavour and sweet corn kernels were a great accompaniment to a warm bowl of winter vegetable soup. Deb, you’re becoming my go-to food blogger for “I crave X, where can I find a recipe?” moments. Thanks for always having exactly what I need! After the resounding success of the blueberry wholewheat pancakes, and ever-searching for decent, wholesome breakfast ideas for my partner, I jumped at the chance to make these. They have just come out of the oven, and I’ve just eaten one. They’re ok. Not amazing, not meh, but totally eatable and a bit moreish, but not amazing. Trouble is, I don’t know what other cornbread tastes like, so have nothing to compare it with. Am wondering whether I went wrong somewhere. Being english, and unused to cups as measurements, I used the conversion chart on this site and weighed out all the bulk dry ingredients. There seemed like a LOT of flour! Secondly, I used a mix of wholeweat, gluten free and rye flour. Same as I used for the pancakes. When I added the wet to the dry ingredients, the mix was very dry, with lots of unmixed flour at the bottom of the bowl. I added tablespoon of water, rinsing out the buttermilk pot with it. I used frozen corn. Here may be another mistake. I used it frozen! I thought it was probably a bad idea, but didn’t have time/patience/wherewithall to defrost it. Was worried about ending up with hot sweetcorn! Used my newly bought silicon cases with muffin tray, and had to squish the mix down into each one, because it was so stiff. After 15mins, they were still uncooked – wobbly when pressed. After 20mins they seemed cooked, but the knife I tested them with came out wet. So they had another 5 mins – in total 25mins. I turned the heat down for the last 5mins, to about 175C. (I’d been cooking them at 200C, electric). Taste: mild. I used two thirds of the sugar, as I prefer less sweet things, and actually substituted xylitol, as I’m trying to wean our house off processed white sugar! Texture: cakey, crumbly. A bit ‘sticking on roof of mouth’. Argh! So many places where I probably went wrong! Disappointed. But not beaten! Will probably try again at some point, maybe without the rye flour. Maybe that was what sucked up all the moisture? 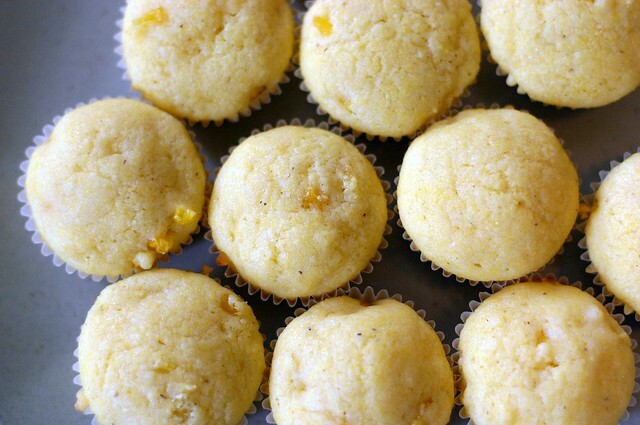 Thank you so much for posting this the Corn Muffin recipe! I just made them for a chili bake off that my husband is hosting for his team of Sales Managers tomorrow. These muffins are the absolute BEST! So moist and rich, and yet light! They have the perfect crumble. Did i mention that I folded in a little sharp cheddar cheese at the very end, right after folding in the corn? Just a couple of small handfuls. OH MY they’re GOOD! Thanks for this recipe and so many, many others! Been a fan since 2007. I love these! I wanted to make them in cupcake tins with liners … could you recommend a ‘frosting’ of sorts? Perhaps brushing the tops with some mascarpone or other cheese and top with corn kernels? They would look and taste so great as a ‘savory cupcake’. I added 1 chopped jalapeno and 1/2 a cup of cheddar cheese to this recipe and they are so beyond delicious!!! Thanks!! Last night’s first corn of the season became this morning’s corn muffins. I used whole wheat flour instead of white and loved them. My son liked them; my daughter didnt. Great, simple recipe! Thanks! I made these for a recent bake sale and got a special shout-out from the organizer that they were very popular. This was in a mass e-mail to those of us who contributed, for special requests to make them again next time. They turned out very moist and delicious! Eating out of the cupboards tonight. I used powdered buttermilk and Trader Joe’s corn salsa (reduced the sugar to 3 T. since it had sugar in it). Nice flavor, but still too sweet for our palates; I’d omit the sugar if I had to do it all over again. It made 20 in my old smaller sized tins. They didn’t rise much, but had nice crispy edges. These were great – I made them to go with some chili last night. It was my first time making anything even close to resembling cornbread and they were delicious. Thanks for the recipe! Hi Deb, I’ve been following this blog for a little while now and I just want to say thank you. I just picked up your book and I’m just so thrilled with your work. When I use one of your recipes I never have to worry about whether or not I and my family will love it. Your writing is totally charming, our recipes are just delicious, and your son is cute as a cupcake! This recipe is so simple and so delicious. Thanks!! Hi, I made these this morning and they were a hit. I had some grilled corn I needed to use up, so this fit the bill! — I totally missed the baking soda, so it never made it in, but they turned out great. These cooked a few extra minutes (21 total) and were lovely. I just made these for an easy Sunday breakfast and they were absolutely luscious. I made the recipe as stated, except I reduced the sugar to 5 Tablespoons, as I eat my cornbread with honey and didn’t want it to be too sweet. I also used frozen corn, straight from the freezer (no thawing) and had no problems. I’d recommend baking these directly in the pan – without liners – that way you get the lovely brown crust on the bottom. Delicious!! Fantastic. I made homemade black / pinto bean chili, my wife made these to go with it. They were delicious, I really love the touch of nutmeg in them. I think that’s what makes them truly spectacular. I love that idea. Thank you!! I have made these muffins so many times that I figure I should post a review. They are fantastic. I’ll never use another recipe for corn muffins. In fact, my family can make a meal of these corn muffins. The inclusion of actual corn kernels and nutmeg make all the difference to me and the buttermilk gives them a great texture. Thanks so much for this recipe. How long would this last for outside of a fridge in an air tight container? Im making a care package and would love to include them. Thanks! Hi Allison — I think that they could last for a day or maybe up to three (they don’t need to be refrigerated) but I have to say, muffins aren’t my favorite for longevity. (Unless, of course, the recipient is a muffin-junkie.) Cookies, brownies and granola bars seem to ship better. Any tips on making this as more of a cornbread rather than a muffin? I made them as mini muffins for Halloween and they were good, but because of the small size, maybe a bit dry-er than I would have liked. May go full size or try the corn and buttermilk popovers……so many choices!! You’ve made me a happy, busy baker and my family very content with the delicious variety of things they get to enjoy. Your recipes are always so reliable!! and a firmish one used for croutons. These were great for a super bowl party with chili and wings. I added a cup of cheddar and fresh chives. Very moist. Also, I made the batter and put it in the muffin tin the day before and they baked perfectly the next day- so great for popping in the oven to bake fresh when needed. Also, halved the sugar since I was adding cheddar. I’ve been wanting to try these muffins for a while, but after finally making them this morning and having one with lunch I was incredibly disappointed. 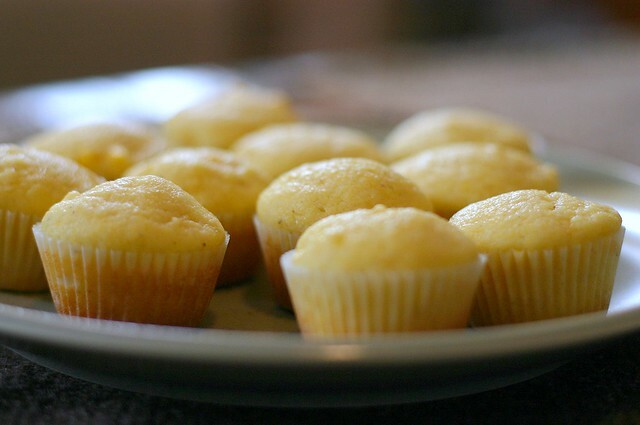 Maybe I was searching for a different type of recipe, but when I envision a corn muffin, I think of a pronounced corn taste with a slightly gritty texture from the corn meal. What I got, was a bland tasting muffin with only the slightest hint of corn. I admit that I overcooked them by a tad. The sides were a deeper brown then what is depicted above, resulting in a slightly crunchy texture on the outside. Could this have affected the flavor? Deb, if you have any suggestions I’d greatly appreciate it! I absolutely love your site and find myself browsing your page at least twice a week for a new recipe posting. Thank you! just in case anyone wants a truly MASSIVE amount of cornbread- doubled this recipe and cooked in a preheated at 400 degrees 12 inch cast iron skillet (with melted/browned butter in it) for 25 minutes at 375 degrees- absolutely delicious. perfect with chili. I made these tonight and thought they were pretty good. I had to make buttermilk from skim and it’s just not that great, so next time I plan to use the real thing and am sure they will be much better. Just wondering – I have very, very old muffin tins that I inherited and I always seem to get 18 Muffins if a recipe calls for 12. Have muffin tin sizes changed since the 60’s? Thanks for any insight! Just made these and added 2 tablespoons of sugar instead of 6. They were yummy: nice, moist and would go well with some kind of salty butter….I think I will make them again but add another additional sugar amount because I like them a bit on the sweet (but not too sweet) side. However they would go really well with some kind of chili or stew/soup. Hey Deb! I love all of your recipes and I can’t wait to try this one for corn muffins. I was just wondering if it could be used to make it in a loaf pan and not a muffin pan. Thanks for your help! I made these last night, and they were delicious. I made the following modifications, based on what I had: instead of buttermilk, I used half 2% milk and half whole yogurt; I used 3 TB sugar instead of 6; I added an extra half-cup of corn kernels. They were perfect! Thanks, Deb. All I really want to say is I wish I had been a little braver and used more paprika (I used 1/2 tsp). Beautiful recipe, although I bet it’d better if I 1) ground my polenta grits a little finer and 2) actually had corn kernels. These muffins just beg for something bad for the waistline – pulled pork, chili, sour cream and mountains of cheese. PS: my batter was SUPER liquidy/wet, but if you let it sit for a bit it thickens up. Also I’m glad I forewent the muffin liners because I had to fill my tin all the way to the top! I’m attempting to make these in a glass pan, because my muffin tin is dirty, and I am lazy… Experimenting for now, but do you have any official input or advice towards temperatures and times? Just pulled these out of the oven – so good! I didn’t have any corn, so I subbed in blueberries. Definitely a good move. I guess they are no longer the “corniest” of muffins, but they are delicious. So light and airy…I just ate 3. I can really taste the nutmeg, I might have used a little too much. I used the full amount of sugar and think it’s perfect, not too sweet. I also just made your buttermilk ice cream. I’m thinking about toasting a few of the muffins and adding them to the ice cream once it’s ready to go into the ice cream maker. (I’m inspired by Jeni’s Ice Cream and her awesome mix-ins. Anyhow, definitely a repeat for me. Thanks, Deb!